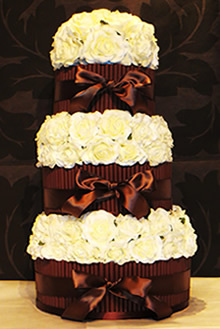 The Chocolate Wedding Cake Company is Nottinghamshire’s premiere wedding cake maker, specialising in stunning chocolate wedding cakes. We only use the finest, fresh ingredients to make our exquisite cakes, which taste as delicious as they look. We insist on free range eggs and use only natural flavourings in our sponges, and of course, the finest Belgian chocolate. We are a small yet professional company, so do not have the overheads of a large business, and can therefore offer the best quality cakes and service at extremely reasonable prices. 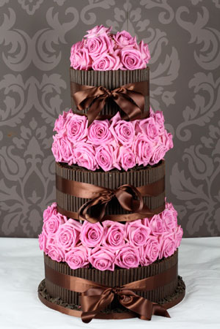 Please be aware that dates do book up quickly, especially in the peak summer months, so a deposit of £100 will make sure your Chocolate Wedding cake is secured for your special day. 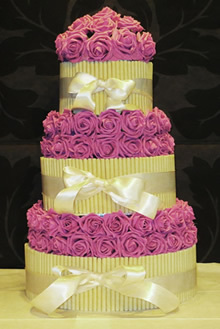 All cakes are individually designed for you, with your choice of sponge, filling and finish. 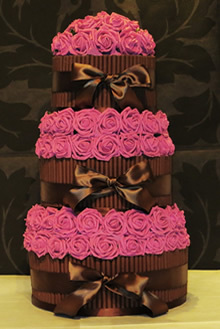 Fresh, silk or even hand made Belgian chocolate flowers can be used to compliment your chosen colour scheme. The floral arrangements can be tailored to your individual requirements, to compliment your wedding flowers. Alternatively, summer fruits can be used to add a mouth watering finishing touch to your cake. All budgets can be catered for. 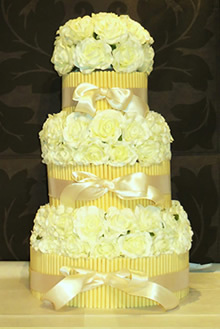 The cake is normally delivered to your chosen Venue a couple of hours before the wedding breakfast. 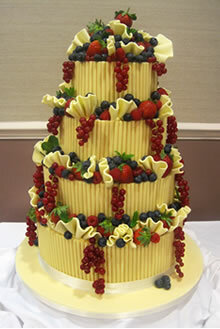 Alternatively, you may prefer to collect the cake on the morning of the wedding. The cake was simply divine, thank you so much!